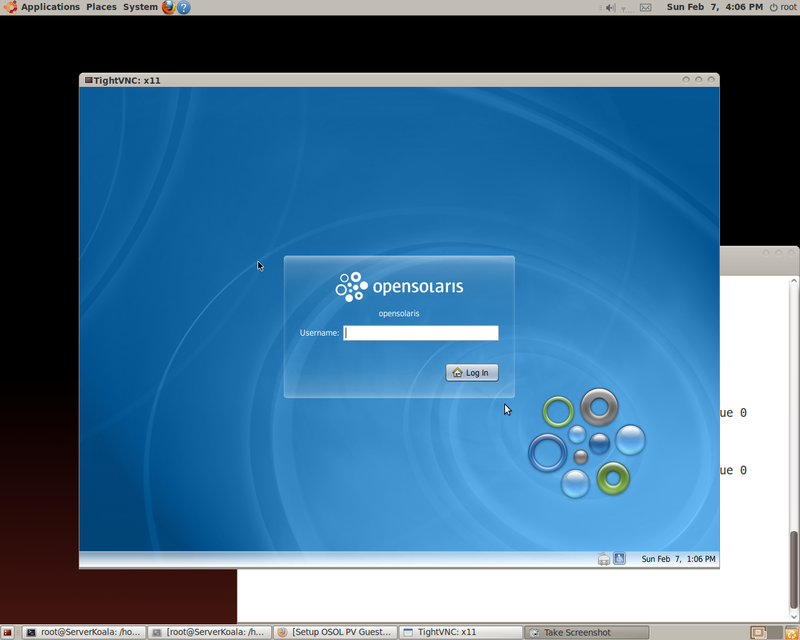 Michael Young wrote xen-4.0.0-0.2.rc4.fc12.src.rpm for Xen-4-rc4 for Fedora 12 to install Hypervisor (changeset 20950). Schema bellow modifying content of mentioned src.rpm allows to build set of RPMS upgrading Xen Hypersor 4.0 matching current tip CS of http://xenbits.xensource.com/xen-unstable.hg,no matter of rc4 in fact, via hot upgrade without rebuilding development Xen System on top of F12 with recent PVOps kernel 2.6.32.9. Directory gemu-xen.git is only determined by value of QEMU_TAG in Config.mk file under xen-unstable tree clone. Comprehension of building Xen Hypervisor SRC RPM for Fedora allows go ahead keeping your local Xen in sync with xen-unstable mercurial tree without touching qemu-common-0.11.0-12.fc12.x86_64, qemu-mg-0.11.0-12.fc12.x86_64,virt-manager-0.8.2-1.fc12.noarch, virt-viewer-0.2.0-1.fc12.x86_64, libvirt-0.7.1-15.fc12.x86_64, libvirt-client-0.7.1-15.fc12.x86_64, libvirt-python-.7.1-15.fc12.x86_64,python-virtinst-0.500.1-2.fc12.noarch. Hot Hypervisor upgrades taking each 10 minutes keeps your system in shape all the way trough. Due to recent set of Change Sets for GRUB 2 Support written by Ian Campbell usual sharing image devices between Ubuntu Karmic Koala Server HVM and PV Guests appears available at Xen-4.0 Linux Dom0. 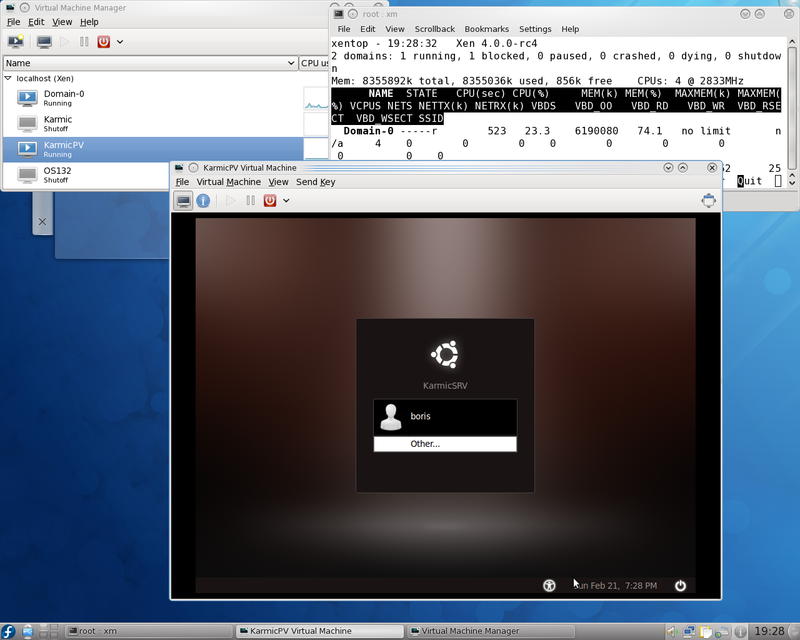 Fedora 12 has been selected due to presence of Libvirt 0.7.1 providing virt-install and virt-manager utilities. Then I tried out a number of current linux distributions, but except for openSuSE none had a dom0 kernel out of the box which really is a shame. Seems I need to look more closely into KVM with virtio support. Article bellow tries to explain that due to efforts of Jan Beulich and Andy Lyon xenified aka Suse Kernel 2.6.31.8(9) may be built on any Linux and along with the most recent stable Xen Hypervisor (3.4.2 and higher) port provide Xen Environment supporting OpenSolaris PV Guests , including the most recent unstable builds like 129,130,131 ( i mean vncserver behavior on OSOL PV DomU and GDM/VNC setup ). 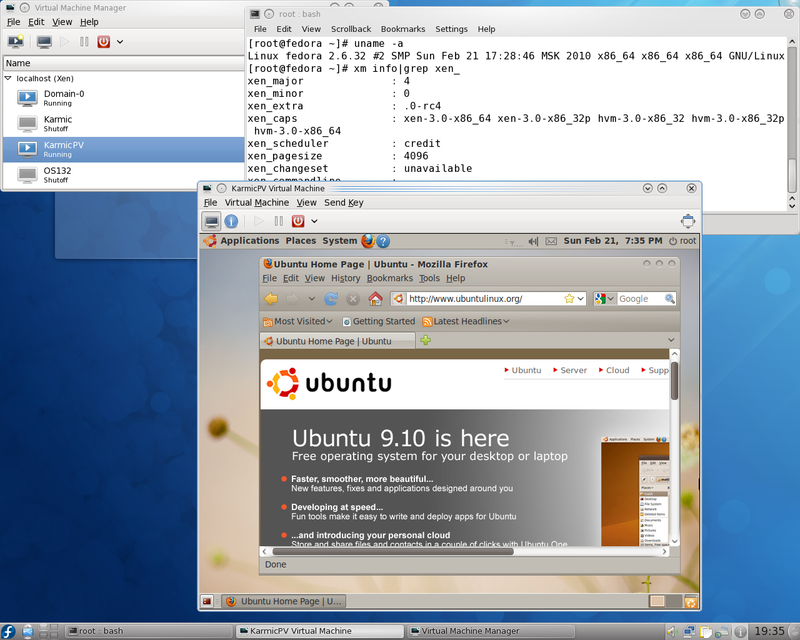 I also choosed Ubuntu Karmic Koala Server with Libvirt 0.7.0 capabilities, actually virsh capabilities, been connected to Xen 3.4.3 Hypervisor one more time reproduce nice schema of John Levon of OSOL PV Guest install at Linux Dom0. 3. 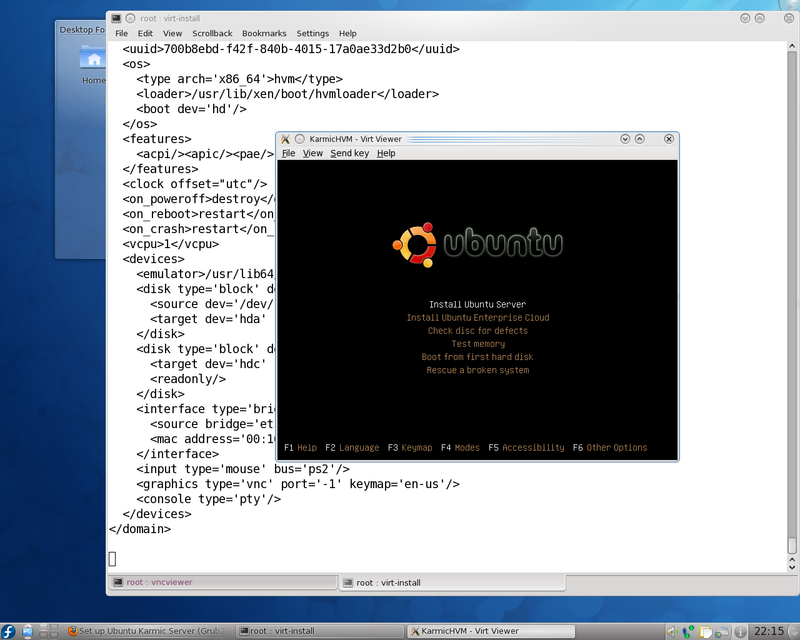 Edit xend-config.sxp set (xend-unix-server yes) . 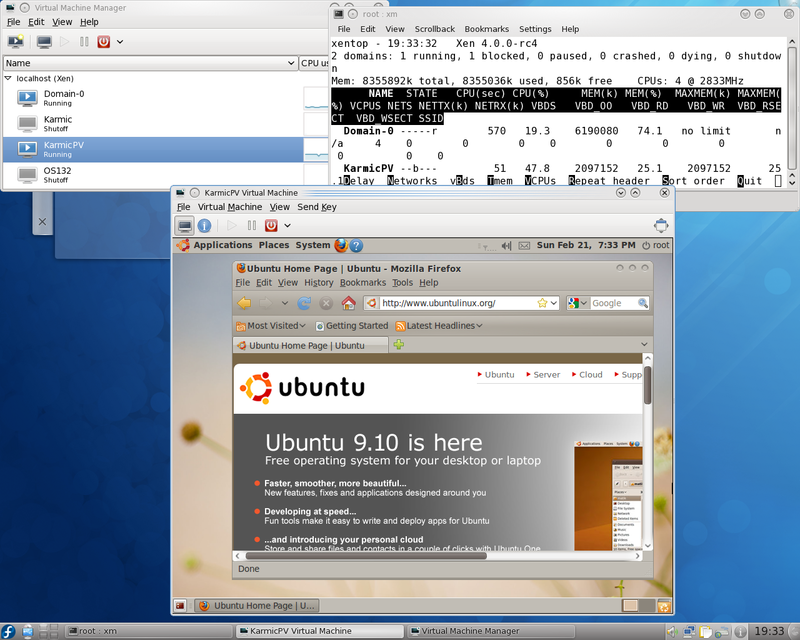 Untar linux-2.6.31.9.tar.bz2 and apply patches. 5.Edit Makefile and set EXTRAVERSION=.9-xen. Build kernel , previously tuned to support Xen at Dom0 , with built-in static command line (root=/dev/sdb11 ro console=tty0) and install. Start Caiman installer and complete PV Guest installation. 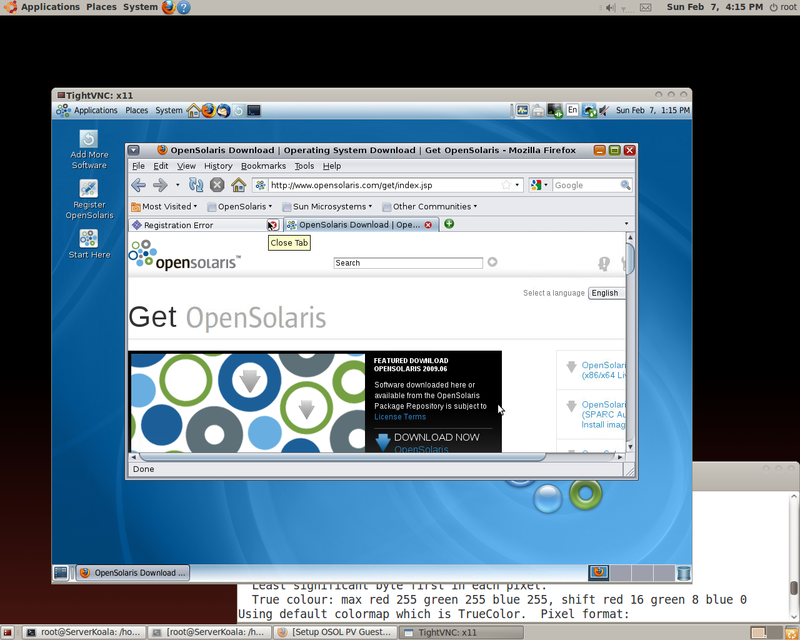 You are currently browsing the Xen Virtualization on Linux and Solaris blog archives for February, 2010.